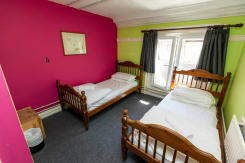 Accommodating backpackers and travellers from all over the world for nearly 25 years, Kinlay House is the place to stay in Dublin. Why? 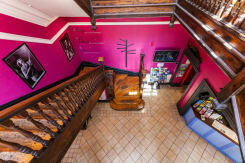 We're in the heart of the city in Temple Bar, we're top rated by Hostelworld customers, we have secure rooms with key-card access and we're in an amazing listed building with loads of common rooms. Plus there's an airport shuttle direct from our hostel to the airport for only €7. 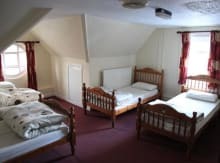 We've got room sizes to cater for any size groups, from singles to 20-bed dorms with ensuite bathroom or shared facilities. We have lots of free stuff on offer, such as free international phone calls, Wi-Fi and Internet access, walking tours every day, and a different free activity every night, such as free pasta, Irish dancing classes and BBQs! Our light breakfast is free and fans of Irish breakfasts can upgrade for just a few Euro. 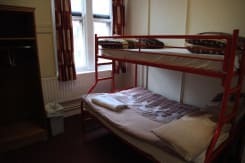 There's also lockers and safety deposit boxes available (even after you check out) and a hostel shop open 24hrs, with food, toiletries, bus tour tickets, umbrellas, adaptors and more. 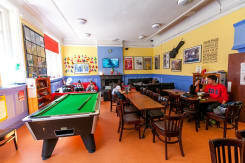 We've got a fully-equipped self-catering kitchen, large dining room, laundry facilities, hair dryers, phone chargers, a postal service and an amazing common room with a pool table, table tennis, tons of DVDs, games, books and even a Wii. We offer bicycle hire, great deals on car hire, tours and attractiosn and discounted taxi rates. And of course, we're the home of the legendary Shamrocker tours. We never close - we're open 365 days a year, 24 hours a day. Please be aware that all persons under 16 years of age must be accompanied by an adult and can only be accommodated in a private room. You can extend check-out to 1pm for 5 Euro extra at reception when checking in, if you want. 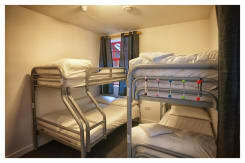 Towels provided free of charge in private rooms (singles, twins, doubles, triples) or for rent for 2 Euro in dorms. Check-in: 2pm. Check-out: 10am. You can extend check-out to 1pm for 5 Euro extra at reception when checking in, if you want. 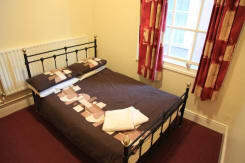 All bed linen provided free of charge. Towels provided free of charge in private rooms (singles, twins, doubles, triples) or for rent for 2 Euro in dorms. EXPRESS BUS: AIRLINK 747. This service operates to and from the airport every 15 minutes and is 6.00 one way / 10.00 return. Get the Airlink 747 right outside arrivals and get off at the bus stop at Christchurch Cathedral - we are right across the road from the bus stop. Journey time approx. 30mins. TAXI: costs between 25-30 depending on traffic and will take between 30-40 minutes. TRAIN: Dublin's train service (DART) operates a service from Dun Laoghaire Dart Station to Tara Street Station in the city centre. 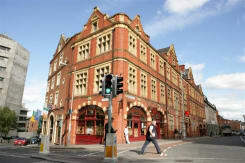 From the station it is about a 15 minute walk to Kinlay House. From Trinity College: Walk along College Green onto Dame Street. Continue onto Lord Edward Street, Kinlay House is at the very top on the right hand side, just before Christchurch Cathedral. Dublin Bus offers a variety of great transport deals for you to exlore and see all that Dublin has to offer. Tickets can be obtained on your arrival at Dublin Airport from the CIE Information Desk in the arrivals hall and from the Dublin Tourism Offices or from many of the news agents in the city. Rambler Tickets: Unlimited travel for one, three, five or seven consecutive days on the Dublin Bus network including the Airlink service (excluding Nitelink, Ferry services & Tours). Prices per adult - one day 6.00, three day 11.00, five day 17.30, seven day 21.00. 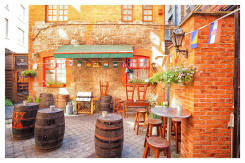 We are in the heart of Dublin's city centre in Temple Bar right beside Christchurch Cathedral. The Guinness Storehouse is close by - a 10-15 minute walk. 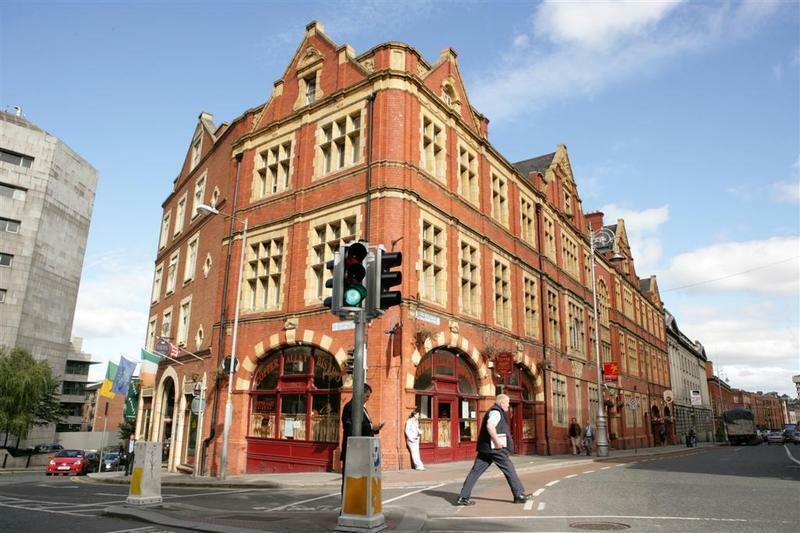 Trinity College, Grafton Street, Dublin Castle and O'Connell Street are all a stroll away. Airlink buses to the airport stop right outside our door - you cannot beat our location.